A community Free House serving fresh homemade food and great beers. A great location to watch sports events. The Lurcher became a Free House in October 2017 when Sheffield couple Liam Casey and Alicja Horsfield purchased the property. The Lurcher is a community pub set on the edge of Rainworth village in Mansfield. The National Cycle Route runs right by the pub, which makes it a great location to visit after a ride or walk. Muddy boots, cyclists and dogs are welcome in the bar and outside seating area. The Lurcher offers a wide range of drinks including real ciders, wines and a large gin selection. A fresh homemade food menu is now on offer complimented by the Chef's Specials menu. 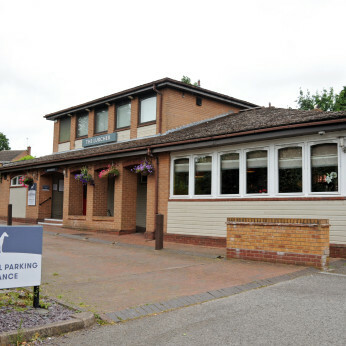 The Lurcher shows both Sky Sports and BT Sports channels on large screen HD televisions throughout the pub including two seating booths in the dining area. Split screen viewing is also available. So we can guarantee you won't miss a minute of the action. The Lurcher also benefits from a popular pool table, darts board and bandit. Add a dessert to any main meal for just £1.50! Available during food service times every Monday. 2 Fish "n" Chips for just £12.95! Two hand battered cod and chips from our main menu served with garden or mushy peas and tartare sauce. Available during food service times every Thursday. Burger and a pint Wednesday's! Add a drink to any burger for only £1.00! Drinks included in offer: Fosters, John Smiths, Strongbow, 125ml House Wine or any regular soft drink. Available during food service times every Wednesday. Last orders fifteen minutes before kitchen closes.